The D.Module2.ADDA8M12 is an A/D, D/A converter daughter card for the D.Module2 family of DSP Computer Modules. Main application areas include ultrasonic and eddy current analysis, radar processing, and communications. The design incorportes two THS12082 converters with programmable 16-level FIFOs. The FIFOs simplify interfacing and relax timing constraints. 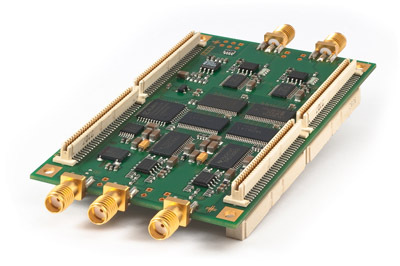 The wide input bandwidth allows to use the ADDA8M12 in subsampling application like I/F sampling in communications equippment. The D/A section uses two DAC7821 converters, followed by an output stage capable of driving 50Ω loads. For OEM systems the SMA input and output connectors can be removed and replaced by 2.54mm pitch board-to-board connectors. The support software contains ready-to-use code examples for DMA-based data acquisition and processing.